Welcome to the rocking chair realm of my website. The free-flowing form of this beautiful rocking chair is indeed a change in pace from the fascinating but structured rigidity of kumiko patterns and kumiko-zaiku. If you are thinking of purchasing one of these extremely comfortable chairs, please have a look through both of my galleries first. I am confident you will be able to see the spirit of the shokunin (craftsman) that was drummed into me during my formal studies in shoji-making in Japan. This uncompromising pride and commitment to quality in all aspects of the task at hand is at the heart of all my work, regardless of the size or scope of the piece. If, after looking through the galleries, you would like to move on to the next step, please go to my Ordering page for details on price and how you can order a rocking chair. 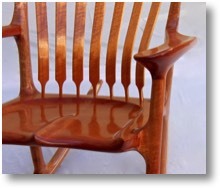 If you are a woodworker, and are eager to tackle the challenge of making your own rocking chair, please go to my Book & Templates page for details on purchasing Hal Taylor's outstanding book and all the templates needed to complete the chair.